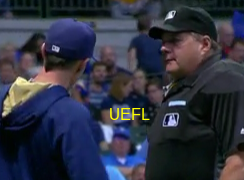 HP Umpire Jerry Layne ejected Brewers Manager Craig Counsell for arguing a foul ball call in the top of the 4th inning of the Pirates-Brewers game. With two out and none on, Pirates batter Adam Frazier attempted to strike a 0-2 slider from Brewers pitcher Jimmy Nelson for a foul ball. Replays do not conclusively indicate whether or not the baseball made contact with Frazier's foot after bouncing off the ground, the call was irrecusable. At the time of the ejection, the Pirates were leading, 4-0. The Pirates ultimately won the contest, 4-1. This is Jerry Layne (24)'s second ejection of the 2016 MLB regular season. Jerry Layne now has 4 points in the UEFL Standings (2 Previous + 2 MLB + 0 Irrecusable Call = 4). Crew Chief Jerry Layne now has 12 points in Crew Division (11 Previous + 1 Irrecusable Call = 12). This is the 175th ejection report of the 2016 regular season. This is the 70th Manager ejection of 2016. This is Milwaukee's 4th ejection of 2016, T-3rd in the NL Central (PIT 14; CIN 7; CHC, MIL 4; STL 1). This is Craig Counsell's 3rd ejection of 2016, 1st since Sept 4 (Brian Gorman; QOC = Y-C [Obstruction]). This is Jerry Layne's first ejection since May 2, 2016 (John Ryan Murphy; QOC = N [Balls/Strikes]). Wrap: Pittsburgh Pirates vs. Milwaukee Brewers, 9/21/16 | Video available via "read more."